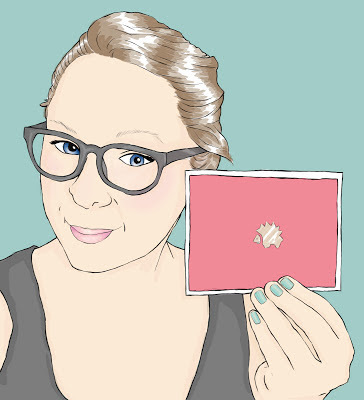 Today's post comes from one of my dearest, loveliest friends, one Miss Leah E. Harrison. Leah is a journalist with the Charlotte Observer and an otherwise wonderful lady. But, I'll let her delightful writing speak for itself. Every spinster owes it to herself to possess an array of exciting stationary. The well-prepared spinster can accommodate any correspondent with her paper supplies, whether she's writing a perfunctory (though always genuine) thank-you note or an installment to a pen pal. My love for beautiful paper no doubt fuels this interest and often functions as a form of discipline--I know I should correspond, so I buy beautiful stationary to entice myself. I have accrued the remnants of nearly 50 stationary sets, equipping me for a professional, soulless letter on matte grey card stock; the more artistic, though still formal notes I bought with a single watercolor goldfish painted in the center (a Crane product--always classy); vintage cigarette and liquor advertisements for those editors who find such things charming; geometric pop-up cards that require extra postage; and recently, I acquired some cards with large insect silhouettes in gold leaf. My newest set came from Target, which carries a great deal of excellent stationary. These are hot pink with tiny gold porcupines stamped in the middle. The lip of the white envelop is patterned with green tick marks. Impeccable. Here's what I look for in stationary: the card should be small--you never want the finished letter to include empty space. I've never bought stationary with 'Thank You' printed on it, no matter how exquisite the design. I want my own prose to say it, not the manufacturing company; the 'Thank You'-laden card just seems disingenuous, which defeats the purpose of a hand-written note. I also need a certain thickness regarding the paper used--I like to write with fine-tip sharpies or something with similarly heavy ink, and I don't want a bleed-through. Because the cards are small, I often write on the back. The card must be thick to avoid conflict. And of course, the design needs to resonate with me, needs to say something about my personality. I own a lot of matte things, a fair amount of modernist-looking sets, and many varieties of playful, fun notes. Lastly, the art of letter writing is all but extinct in the technology age, making you extra charming if you do it. Think of all the letters pre-Darcy Elizabeth Bennet wrote! Think of the beautiful stamps you can pick out (ask to see the whole book of stamps at the post office, don't settle for the Liberty Bell)! And best of all, think of what it feels like to receive a beautiful little envelop in your mailbox.